What is it about cats? Aloof, independent, marathon sleepers, expert hunters, master climbers and your friend, but only on their terms. They are fascinating and well-loved pets to some, yet despised and put into dustbins by others. They rival dogs as our favourite pets and were once considered sacred deities by the ancient Egyptians. They are featured in calendars, novels, their own diaries, films, cartoons, haiku and of course, on YouTube! I have to admit I’ve spent many an hour browsing through endless compilations of cats doing crazy things. It’s pure entertainment. Don’t get me wrong, I spend equal amounts of time browsing ‘dogs to the craziest things’ videos, but today, it’s all about the cats. Take for instance, Maru who enjoys trying to insert himself into boxes that were clearly never intended for cat habitation. Or perhaps a strange Japanese show where cats climb into bowls…?! Quite recently, a friend of mine announced that she was opening a luxury 5 star cat hotel. I was fascinated to learn that the franchise offers four poster beds with silk sheets, music piped into the rooms, trout breakfasts, cat massage, a dedicated cat entertainer and the option to have your cat send you a postcard whilst you are away. Wow, what more is there to say? 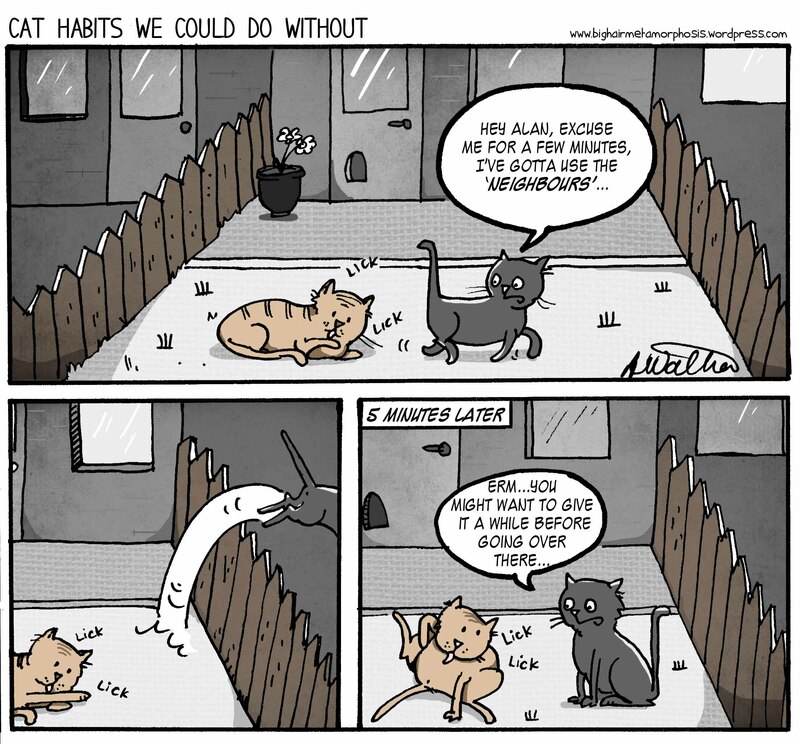 Perhaps I should leave you with the cartoon…it brings cats down a peg or two. This entry was posted in Animals, Cats and tagged animals, art, cartoon, cats, comic, funny, garden, habits, humor by bighair63. Bookmark the permalink.